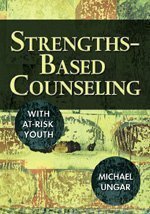 "Strengths-Based Counseling With At-Risk Youth"
Michael Ungar received a Ph.D. in Social Work from Wilfred Laurier University in 1995. He is currently an Associate Professor in the Maritime School of Social Work at Dalhousie University, Canada. He has published articles in such journals as Adolescence, Youth & Society, Qualitative Social Work, Social Service Review, the Journal of Systemic Therapies, and Child & Youth Care Forum. Dr. Ungar has been researching, writing, and teaching about resilience among youth for ten years in Canada, the U.S., Hong Kong, and Columbia. He oversees a federally funded international research project involving collaboration among researchers in eleven sites on five continents exploring similarities and differences in how resilience is understood, studied, and nurtured. As part of this, he will soon embark on a tour of Israel, England, Russia, and Tanzania. He recently presented two papers detailing his work at an international qualitative methods conference hosted by Sage and the International Institute for Qualitative Methods. He has a well-established international network of colleagues in this field across many disciplines, and many will be contributors to this volume.